There are so many creative ways to bring light into a home. This addition in Ghent designed by Atelier Vens Vanbelle introduces natural light in a soft and organic way - like a forest. Located at the rear of a house, the project features timber columns topped fins that radiate outwards to create intricate patterns interspersed with skylights. The couple living in the house wanted a new kitchen, a new bathroom and a more spacious, daylit home. In order to provide more natural lighting, the architects designed the extension with three rectangular skylights and a glass wall. 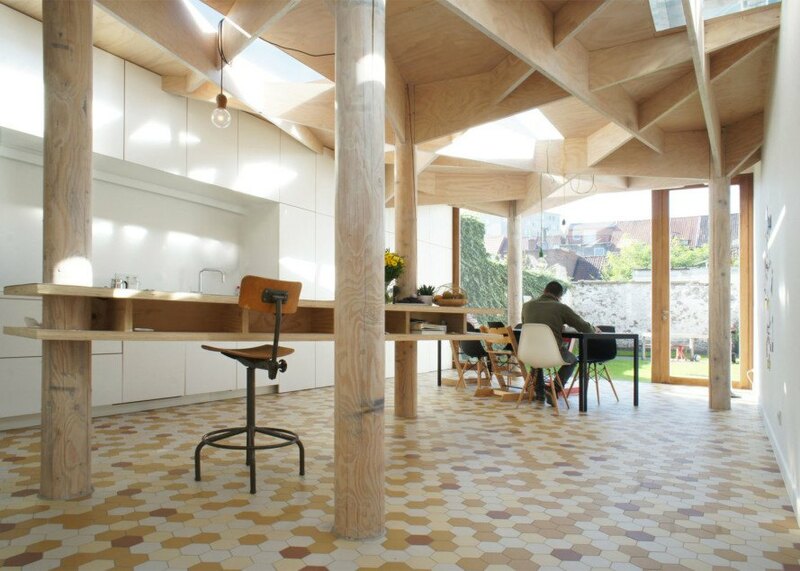 The kitchen floor is covered in hexagonal tiles that reflect the geometric timber patterns formed on the ceiling and the hexagonal brown paving stone embedded in the lawn. 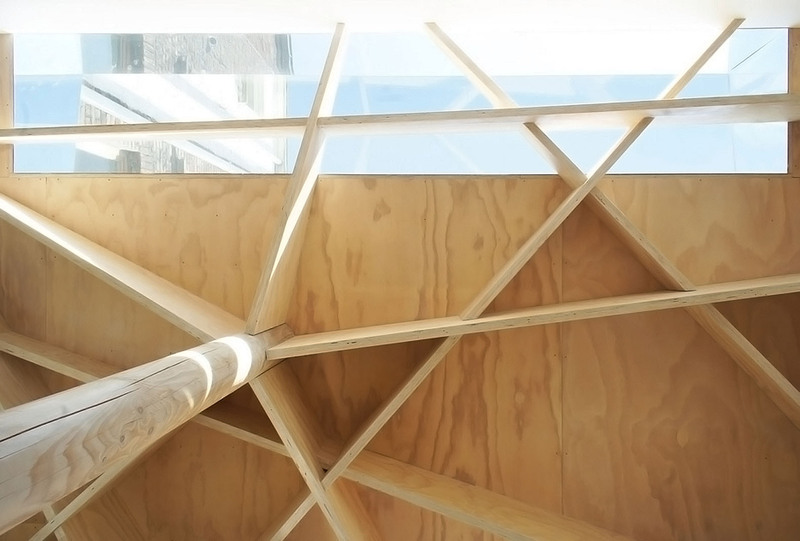 The atrium, which cuts through the ceiling of the lounge, frames views of the ground floor. The couple living in the house wanted a new kitchen, a new bathroom and a more spacious, daylit home. In order to provide more natural lighting, the architects designed the extension with three rectangular skylights and a glass wall. The kitchen floor is covered in hexagonal tiles that reflect the geometric patterns formed on the ceiling and the hexagonal brown paving stone embedded in the lawn. The atrium, which cuts through the ceiling of the lounge, frames views of the ground floor. "Instead of building a kitchen, a space that evokes the feeling of an autumn stroll was designed," said the architects. "The light falls through a series of skylights subtly through the fin structure of the ceiling, the floor appears to be covered with leaves, and tree trunks make the hike through this space adventurous."